Many common beliefs surrounding cats relate to fortune, with cats being cast as portents of either good or bad luck. Other superstitions hold that cats control or predict the weather and that they embody the souls of dead ancestors or supernatural beings. Japan’s Maneko Neko, or “good luck cat,” is a beckoning feline with one paw raised that is said to bring good fortune. As it is believed to invite wealth, piggy banks are often created in the shape of the Maneko Neko. 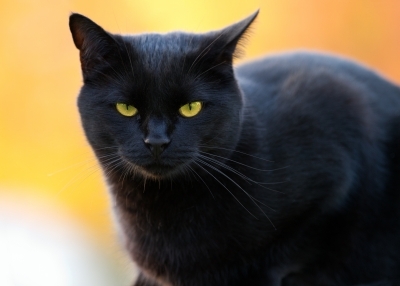 Although having a black cat cross one’s path is considered bad luck in America and various European countries outside the UK, in Germany, if the black cat crosses from left to right, it portends good luck (crossing in the other direction indicates bad luck). Stroking a black cat will ensure health and wealth. Myths involving cats and the safety of boats at sea are also quite common. In certain fishing communities, the wives of fisherman will keep cats indoors, as this is believed to protect their men from peril at sea. Also, sailors once thought that throwing a cat overboard would cause their ship to sink in a storm. A cat licking its tail or washing behind its ears meant that rain was on its way. A restless cat indicated that a storm was brewing. When a cat pointed its tail toward the fireplace, bad weather would follow shortly thereafter. Pouring or sprinkling water on a cat would make it rain. Drown a cat and the Devil will get you. If a cat leaps over a corpse, the dead body will reanimate as a vampire. Mummifying a cat and placing it inside a wall will ward off evil spirits. Cats have also been linked with positive spiritual beliefs, the best known of which is the Egyptian reverence for felines. Other examples include Latvia, where a black cat in a grain silo is a good thing because these cats are the manifestation of the harvest god Rungis, and Japan, where a cat with a black spot on its fur embodies the soul of a dead ancestor. Deities that could assume the form of a cat have included the goddess Diana in Rome, the god Ai Apaec in Peru, and the deity Li Shou in China, which had the power to ward off evil spirits. In Burma and Siam, when a holy man died, it was believed that his spirit would enter a cat. Then, when the cat died, his spirit was transported to paradise. In Scandinavia, the goddess Freyja rode a cat-drawn chariot, and farmers would leave offerings for Freyja’s cats so that their harvests would be bountiful. Similar ideas regarding cats and fertility led some Europeans to decorate cats with ribbons and send them into fields after the harvest to appease the gods. If a cat washes itself, company is coming. Upon seeing a one-eyed cat, a person should make a wish, then spit on his thumb and stamp it into the palm of his hand so that the wish will come true. Pregnant women should not allow cats to sleep on their laps, or their babies may be born with cat faces. A cat bitten once by a snake dreads even rope (Arabian). A cat has nine lives. For three he plays, for three he strays, and for the last three he stays (English). A cat is a lion in a jungle of small bushes (Hindu). A cat may look at a king (English). A house without either a cat or a dog is the house of a scoundrel (Portuguese). After dark all cats are leopards (Native American). An old cat will not learn how to dance (Moroccan). Beware of people who dislike cats (Irish). Curiosity killed the cat, Satisfaction brought it back! (English). Handsome cats and fat dung heaps are the sign of a good farmer (French). Happy is the home with at least one cat (Italian). Happy owner, happy cat. Indifferent owner, reclusive cat (Chinese). Honest as the cat when the meat’s out of reach (English). I gave an order to the cat, and the cat gave it to its tail (Chinese). If stretching were wealth, the cat would be rich (African). If you can’t feed the cats, you must feed the rats (American). In a cat’s eye, all things belong to cats (English). It is better to feed one cat than many mice (Norwegian). Nature breaks through the eyes of the cat (Irish). One should not send a cat to deliver cream (Yiddish). The cat who frightens the mice away is as good as the cat who eats them (German). The man who loves cats will love his wife (Russian). Those who dislike cats will be carried to the cemetery in the rain (Dutch). To live long, eat like a cat, drink like a dog (German). When rats infest the palace a lame cat is better than the swiftest horse (Chinese). When the cat’s away, the mice will play (English). When the mouse laughs at the cat there’s a hole nearby (Nigerian). Who cares well for cats will marry as well as he or she could ever wish (French). You will always be lucky if you know how to make friends with strange cats (American). Australian Media Pty Ltd. (2010). “Cat Proverbs.” CatQuotes.com. Barnhart, D.N. (2007). “Cat Proverbs.” CatLover.org. Hartwell, S. (1995). “Feline Folktails – Cats in Folklore and Superstition.” MessyBeast.com. Potter, C. (1983). Encyclopedia of Superstitions. London, UK: Michael O’Mara Books Ltd.
My husband said that having a cat around you when your pregnant is bad because the cat does sumthing to the baby’s soul? It gote wondering, can you help me with that?